Some people think that the naturalists at Lyon Oaks County Park have one of the hardest jobs around. Oakland County’s newest park is bordered on one side by I-96, on another by an industrial park, includes an 18-hole golf course and is spilt in the middle by gas pipeline corridor. So where could anything wild possibly hide here? When the area was destined to become a trailer park, Oakland County began acquiring the land in 1992 and 10 years later opened the Lyon Oaks Golf Course. In 2003, the 1,043-acre park added the first phase of a trail system, a small nature center and a 13-acre bark park, an off-leased area for dogs. Despite the bark park and the manicured fairways, the vast majority of Lyon Oaks is a low-lying woods, dotted by pools of standing waters, small ponds and bogs that are bug-infested in the summer but beautiful in the spring. There is only 50 feet of elevation from one end of the park to the other, the reason for so many wetlands here. And wildlife loves wetlands. This oasis lodged between an interstate and a industrial park is home to coyote, red and gray fox, mink and Michigan's only venomous snake, the massasauga rattler. Deer are so plentiful that the park stages a limited archery hunt beginning in October. But the best reason to visit the park is to enjoy the spring migration of birds. 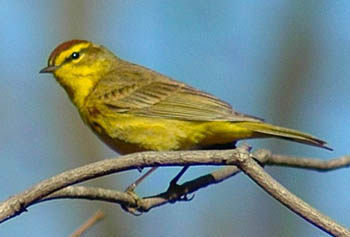 Along with sandhill cranes, wood ducks and other waterfowl, Lyon Oaks is a showcase for warblers whose migration peaks in early May. Arrive with your binoculars and bird book and then take to the woods via 3.6 miles of hiking trails. Lyons Oaks has six named trails that wind 3.6 miles through 800 acres of the park’s environmentally-sensitive wetlands and woods. To reach the main trailhead you leave the car behind and follow a two-track for 0.3 mile past the bark park and through an old farm field. The trailhead is located on the edge of a hardwood forest and departing south from it is Squawroots Trail which merges into a mile long-loop called Wood Duck Way. Heading east from the trailhead is Coyote Corridor. Linking Wood Duck Way and Coyote Corridor is Red-Tail Run. All four trails are wide, gravel paths that can be combined for an easy, 3-mile loop. Wood Duck Way is the most interesting walk as it borders wetlands and along the way passes a rockery observation deck. 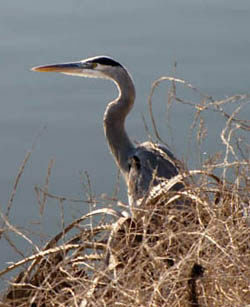 The man-made rookery was built 2006 as an attempt to start a great blue heron colony and nesting site. Most of the remaining trails stay in the woods. The area can be wet, especially in the spring, but the crushed gravel keeps your feet dry. Occasionally you can hear and even see the traffic speeding along on I-96 but it's a just brief intrusion as the trail will quickly lead you deeper into the woods where you can resume looking for warblers and listening to spring peepers. In this corner of the state, that's as wild as you can get. Lyon Oaks features an Arthur Hills-designed, 18-hole golf course and driving range and a 13-acre, fenced Dog Park for canine pets and their owners. Along with the hiking trails, there is a picnic shelter, playground and recreation fields. 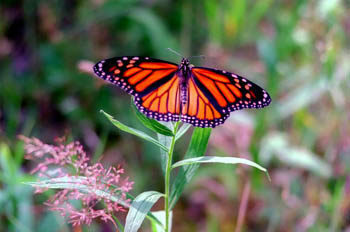 The small Lyons Oaks Nature Center offers exhibits and year-round educational programs conducted by park naturalists as well as a butterfly garden. The park is open year-round from a half hour before sunrise to half hour after sunset. Lyon Oaks Nature Center is open Friday and Saturday from 10 a.m. to 5 p.m. and Sunday from noon to 5 p.m. Keep in mind that archery deer hunting is allowed in a limited area from October to January. A motor vehicle daily permit or an annual Oakland County Parks pass is required to enter the park by both county residents and non-residents. Lyon Oaks is located in southwest Oakland County and best reached from I-96. Depart I-96 at exit 155 and head north on Milford Road then east on Pontiac Trail. 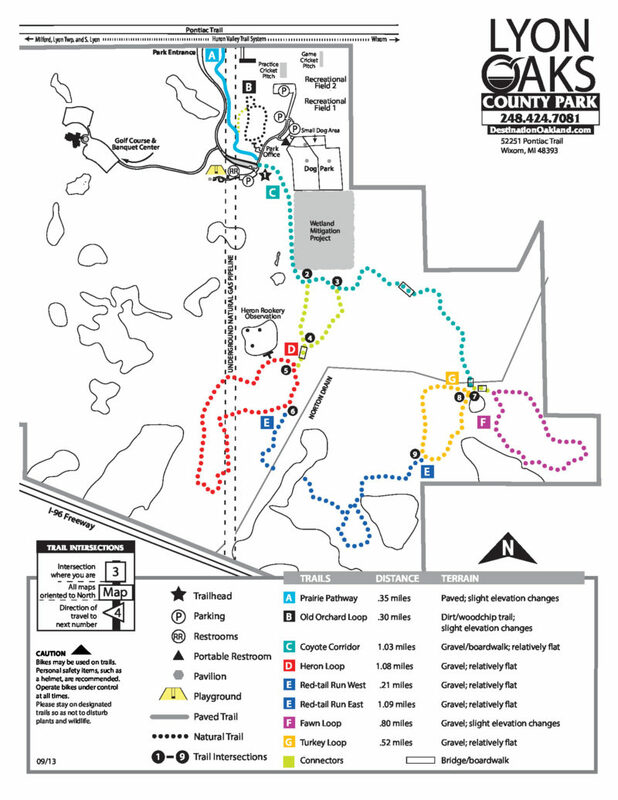 The park entrance is on Pontiac Trail between Old Plank and Wixom Roads. Contact the Lyon Oaks Nature Center (248-437-7345), the Lyon Oaks Golf Course (248-437-1488) or the Oakland County Parks and Recreation website (www.DestinationOakland.com).